I went to The Nile Project on October 29, thinking that I could watch the performance and eat my dinner at the same time. Five minutes in, I had tomato stains on my shirt. Ten minutes in, I nearly choked on a corn kernel. Fifteen minutes in, I dropped my fork, almost stabbed my left hallux, and gave up trying to finish my salad. After the concert, I left the East Plaza hungrier than I had been at the start, but feeling emotionally and mentally fulfilled. 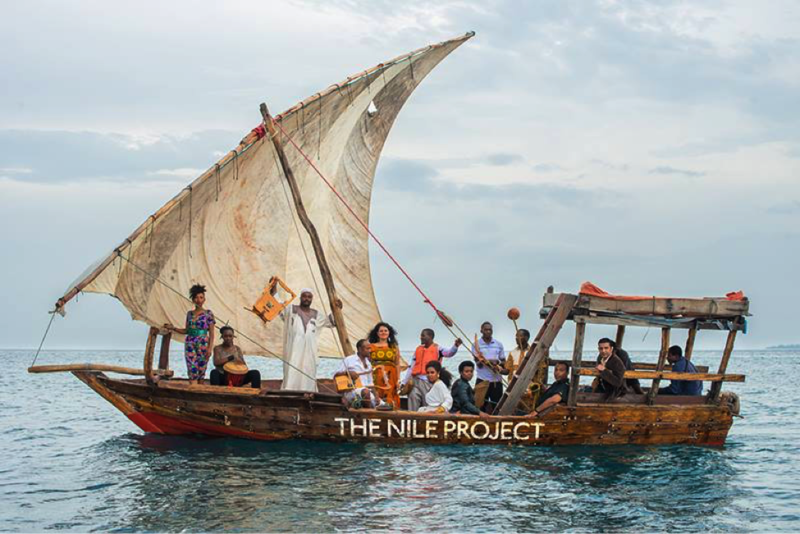 Having read the NYU Abu Dhabi Arts Center’s description ahead of the performance, I understood that The Nile Project formed in 2011 as a musical response to water conflicts in the Nile Basin. The project brings together “musicians of all 11 Nile countries […] to empower university students around the world with the tools they need to make the Nile more sustainable,” the Arts Center’s webpage informed me further. 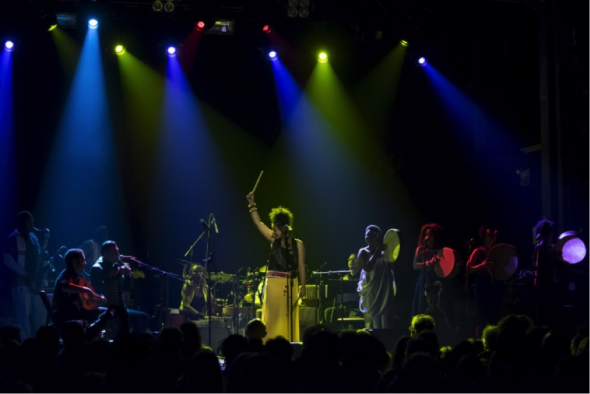 Given The Nile Project’s lofty political aspirations, I went to Thursday’s performance expecting a concert that had the main goal of sending a message to the Nile countries fighting over water rights, but would also make me dance. For the first five minutes of the concert, that expectation seemed spot-on: The opening act had the slow, somber pace I expected. But after the first song, I witnessed a veritable explosion of sound and realized how incorrect my expectations about the performance had been. Instead of setting their message to the sad tune I expected, The Nile Project delivered an upbeat performance that celebrated the life and music of the Nile countries. I had prepared to hear music with a message that might make me dance; The Nile Project played dance music that also had a message. The Nile Project sings in a dozen languages; I thought I at least spoke one of them, but my semester of Classical Arabic did not help me understand the Egyptian singer Dina el Wedidi. For those of us who didn’t understand the lyrics, the group conveyed a mood rather than a discernable message. As Kate Melville-Rea (NYUAD’18) put it when I asked her to help me get a sense of what the group’s lyrics mean: “It’s not art if everyone understands it. Once you know what they’re singing, it loses its power.” The Nile Project certainly has that power intact. Were the members of The Nile Project to read this reaction (a hypothetical I would be flattering myself with if I thought it likely), they might feel they had failed to convey the message behind their music to me. Far from feeling let down, I want to congratulate them: Despite my utter ignorance about the subject and lyrics of their songs, they elicited a visceral response in me that I have not felt since Toshi Reagon performed Parable of the Sower at NYU Abu Dhabi earlier this fall. That parallel to Reagon’s performance says a lot about both the subject matter (water scarcity and conflict) and quality (mind-boggling) of the show The Nile Project put on at NYUAD last month. Despite playing to a jam-packed East Plaza, The Nile Project managed to keep their performance as intimate as if they sat on a half-circle of chairs in the confines of NYU Abu Dhabi’s Black Box Theater, capacity 150. Using more instruments than I knew existed, playing complex rhythms that boggled the minds of people with far more musical talent than I have, and exuding a happiness that seems to defy the sobering reality of what they are singing about, The Nile Project gave a performance that left me wanting answers. How did the singer make that vocal hiccup? What was the name of that piece with the jazz saxophonist? Who sang which songs? What was the name of that feather mask? Why did it have to end so soon? I do not know the answer to any of those questions, nor would I want to. Instead of taking a palpable lesson from The Nile Project, I took a mood, an uplifting sense of possibility and collaboration.